Lapsed blogger that I am, I do hope a few of you are still out there, cause I’m burning to share some news. Thanks to your let’s-do-it spirit, and your enthusiastic on-and off-line comments, the inspiration that emerged through my 9/11 Bowing Project, and the ideas I talked about in the Want a Miracle post has now morphed into a new website,www.fertileheartedhuman.org, gorgeous t-shirts, a video, a petition, a lovely meeting room in Tribeca, a Turn It Around Chant (which hopefully we’ll be posting on the new site soon, and most important: An anticipated gathering at Ground Zero on September 11. Moving forward with this project has been once again a stupendous opportunity for nudging the Orphans out of the Orphanage; and rousing the slumbering-Visionary-Rebel-Mama in me. A few days ago, a beloved teacher, Rabbi Yael Romer, who was lucky enough to have studied with Ellie Wiesel was telling me about his views on parenthood. Ellie Wiesel, as some of you might know, is the recipient of the 1986 Nobel Peace Prize, the author of some of the most haunting books about the Holocaust; a revered teacher and humanitarian. Rabbi Romer said that for most of his life Ellie Wiesel didn’t want to have children. I imagine that having lived through one of the darkest nights of human history, the possibility, that his child might need to experience similar horrors, was too much for him to bear. It was not until he was much older that he finally decided to become a father. To him, as Rabbi Romer reports, this was the highest form of optimism for the human race. The answer to that question reveals itself for everyone who embarks on a pilgrimage to find it.I know for me, there is one overriding reason for the arrival of all life-challenges. Pain is sometimes the only way that life can get our attention, the only way to crack our hearts open to the current injustices and suffering of our next door neighbor or the victim of child-trafficking across the globe. Sadly, for many of us (I’ve done this countless times, just hope I’m doing it less) as soon the pain subsides, so does our resolve for action. Sometimes all that needs to happen is a positive pregnancy test, and the flame-of-the-emerging-activist-heart, the drive to– do the right thing; to speak up for the benefit of others– fizzles out never to be seen again. Like Ellie Wiesel, I too have lived my faith in the human race through giving birth to two beautiful human beings. But unless I earn my optimism through continued commitment to speaking up for Truth, Justice, Compassion, in whatever imperfect ways I’m able to speak up, I’m not only betraying all the victims of violence who perished throughout the ages, while the human-majority remained mute, I’m betraying all the future children that many of us so fervently long to bring into the world. Here’s to Turning it Around! Between September and November 9th, Birth Your Next Creation Peer Circles are planned in London, San Francisco, Santa Fe, and encouraged in as many places around the world as possible. Feel free to call on us for guidance if you’d like to initiate an event in your community. Thank you for channeling efforts for peace – for a world that is safer for everyone. How wonderful to guide people in turn it around fertilehearted workshops and help people deal with the challenging forces within themselves. Julia, it sounds like you are following your heart and thinking big. I hear the subtitle of your book The Fertile Female ringing out–“How the Power of Longing for a Child Can Save Your Life and Change the World”…Kudos to you for the big steps you are taking. Turning things around indeed. Thank you for bringing this need to light Julia. I have struggled for many years to understand how I have humanity and empathy when I was born to people who had none. It was only a burden which caused me more pain in that family, but I am guessing it is a gift and one that maybe I wasn’t meant to use to help them but others. When I read this I googled Ellie Wiesel because I so understood not wanting to bring any children into this world and then coming to a different point of view. In the past year and a half doing this work I have unfrozen alot of myself and gradually brought my real life out instead of the facade I usually put up. My secondary infertility has been one of the most difficult things in my life – second only to the childhood sexual abuse which I feel is contributing to it. I have been working towards contributing to peace in this world by realizing I don’t have anything to be ashamed or quiet about. I didn’t do anything wrong. And with 1 in 4 girls and 1 in 6 boys estimated going through this (I know I wasn’t counted in that) maybe the one reason I can find this happened to me is for me to heal and speak out. With statistics like that and people grew up to talk about it maybe they would start to come down. I am happy to say I will be attending the workshop in SanFrancisco next weekend and am taking the very last flight out on Sunday night to make sure I can attend the gathering on the Golden Gate Bridge. This community has brought me great peace in this journey to another child. I do not know if I have the strength to do this work alone. So thankyou to all of you! First, I want to express my support for Julia and for everyone involved here. I find the comments interesting and helpful as well as the post itself and the FH process has been really helpful to me in the short time I’ve done it and I am committed to doing it for at least the length of this phone circle, if not well beyond. Second, this post brings a lot of questions and challenges to me and I want to share them and know what others have to say. In her post about this project in 2007 (http://fertileheart.com/projects_911.php), Julia writes the following. “The intention of the Bowing Project is to increase awareness of what, for me, is an essential step toward honoring the lives of the women, men, and children, killed six years ago. We can blame presidents, governments, the military industrial complex or Osama. And admittedly they might have a hand in what happened. But the frustrated, trigger-happy orphan crouched in the corner of our hearts co-creates all that is: in our own lives and in the world. Granting that orphan compassionate permission to speak his or her –twisted truth – plays a key role in correcting our collective errors. Also, at the end of her cd Body Truth, Julia says the only battle worth waging is the one inside our own hearts. I am struggling, one of my orphans is struggling, with this. How do we protect ourselves from the orphans of others while trying to nurture and free the orphan inside? The injustice of the world seems overwhelmingly great to me. Knowing that each one of us has evil as well as good in our hearts and that at any given time the balance can tip, leaves me cold. And my own breath in the face of such imperfection and endless challenge seems small. Sometimes I feel I don’t trust anyone and this is why. It bothers me that because we each possess good and evil, there is neither universal good nor universal evil. In the face of politics, wars, genocide, terrorism – are there good people and bad people or simply good acts and bad acts? When you are on one side of one of these conflicts, how do you see the orphan in you and the orphan in the other? Should I seek to recognize the orphan, or bow to the good, of the people in the corporation that’s trying to sell me prenatal vitamins with lead in them; the doctor who tested me incorrectly; the stupid, random person who asks me whether I am pregnant when I just had a miscarriage? Congratulations Julia! It is an inspiration to see you birth this community. Given the powerful nature of your work and the tools you have shared, it always seemed to me that it was all about much more than babies. I remember very clearly crying, sobbing–many times while trying to get pregnant, wondering WHY, why did I have to be challenged, denied, rejected by what you call the Bestower of Babies. But through your work I learned to stand up and keep walking toward what I wanted, to just keep walking. When I fell in the road’s potholes, when I was exhausted and when the whole world seemed against me, I knew that if I could just put one foot in front of the other that somehow I would be OK. I needed to WALK and LISTEN and ACT and BE KIND to myself, and to trust my own authority, among other things. I had to learn to really FIGHT for myself, something I had never done. Now that I am a parent through adoption, I feel that my soul longed for something that I wasn’t consciously aware of. I thought I just wanted a baby, but what I really wanted was a baby AND to be connected to my passions, my purpose, my visionary, and to meaningful community. I really had convinced myself that nothing else mattered except that I have my baby. I mistakenly thought I could deal with the rest later. My daughter is from Micronesia. A few weeks ago there were two editorials in the New York Times regarding her country, which is on the brink of extinction due to rising waters. In the 40’s the US blasted nuclear weapons on their beautiful atolls, and as a result the people are still struggling with anger and sadness and cancer. But we have found that many people don’t know about Micronesian history, or even where her country is located. This week the President of Palau spoke to the UN about the horrors of illegal overfishing in the Pacific–illegal fishing. Knowing these things, it is impossible now for me to go about my life and not try somehow to better things for my daughter’s country and culture. Things which really affect the rest of the planet. I am not sure what that will look like, but it seems inevitable. I also discovered how unethical much of the adoption world is. So much of it is greed-based: money-making agencies who prey on people who they know are desperate to have a child. I think most of it is good. But much of it is bad, bad, bad. I’ve been thinking a lot lately about the idea of “not wanting to feel the pain”, and I’ve been consciously trying to be aware of ways in which I do this, or in which I have done this in the past. Such an eye-opener. Also, I found out that when I was 2 my mother went to work, not because she had to, but because all the other women on her street were losing their husbands to war, and she couldn’t take the intense grief and despair that permeated the neighborhood. So she put us in daycare and got as far away as she could. This made me see my mother more deeply as well as my own history. I grew up in an activist household. I remember the boycotts and the protests, and the posters against war. I remember the music and the communities. I am thankful that my parents set an example in standing up for what you believe in, although some of their lessons are only now starting to sink in. I am not clear about the way in which the activist in me will be birthed –as a speaker (doubtful! ), writer, financial donator, protester, etc. but I’m trying to stay true to myself by connecting with myself through the BodyTruth exercises. I am finding that as I make it a priority to treat it like medicine, I am seeing how powerful it really it really is. It’s amazing the difference commitment makes. Another thought about avoiding pain: A few weeks ago I visited our County fair. I brought my daughter to see the animals, but I was astounded when we came to the pigs. They were being treated humanely but I felt like they were clearly distressed. I had this need to connect with them so I sat down and put my hands on their backs and just rested them there. What bugged me is that people were standing there talking about them in terms of the amount of $ they would bring in when they were slaughtered, without any regard to the fact that they were emotional beings. I’m not against eating meat, but there was something missing here on the part of the sellers. I noticed the pigs had the most human-looking eyes . One in particular had beautiful hazel eyes, and as I watched him I wondered if he knew what was going on, and if perhaps he had chosen his earthly assignment, or not. Was he terrified when he was killed, or was it done in a way that he went peacefully? It seems the life force of the animals we eat then becomes a part of our own life force. So doesn’t it matter? A LOT? Do I really want to consume the life force of an animal who endured pain, suffering, fear, anger? I wonder with sadness why I am so sensitive to this . Is this something that makes me angry or just sad? I am not sure. What a poignant day! I am so glad that I made it to the 9/11 event and workshop after. There is much to be said for the group of us singing our “turn around” chant with the voices of the people calling out the names of the 2700 people that were killed on 9/11. The voices were those of their loved one’s it broke my heart to hear; my little brother, my loving son or daughter, my husband and then the name of the person. Thank you Julia for this call action! Now that I have an increased awareness of all the violence around us I see and hear it all the time. I was listening to NPR this morning and they had a segment on Kashmir and this woman reporting how her father had his morning tea and went out and never returned..she assumes he was killed by police, how utterly devastating. How can I sit still and do nothing? I was inspired to reach out to my family in Sri-Lanka and let them know about the project..they are trying to rebuild the country after a horrendous bloody civil war that lasted 15years.. Just one step at a time I think we can make a difference.. Yes, dear, dear Julia and beautiful community! I raise my glass of juice to Turning it Around. I could use some turn around in my personal life and I am sure that this world can use every ounce of turn around energy we can offer. I am in the midst of my seventh miscarriage and my heart is, yet again, cracked open. It is such a source of solace and strength to tune into this site and feel inspired – inspired by the FH mamas who brought their precious children to Ground Zero, inspired by all those commenting here, inspired by Julia’s story and ongoing commitment to make our world a better place. I am grateful, so grateful, and re-energized. Julia’s “From 9/11 to 11/9: Activist Mamas Say, Turn It Around” project at Ground Zero was a great day that touched many people. So many people stopped by to look at the materials on her peace project, it was wonderful. It was inspiring to see that so many people truly cared. What a wonderful day! It has taken me a week to post this because I’ve been reflecting a lot on the experience and how much I need to do more of this kind of “action.” It brought me back to some of my activism of my 20s and reminded me of the larger picture as I continue my co-creation birthing project. Thank you Julia! your insight and positivity is inspiring – I wish I were closer so that I could take part in some of these activities, but I know that they will be successful! I will be there in spirit! 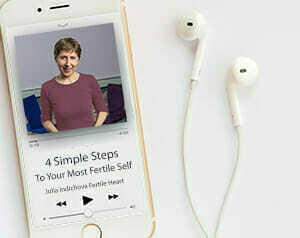 For now, my goal is to stay healthy and positive – after a single session with you, but following up with my daily “homework”, I am thrilled to say that I am pregnant…very early, but I feel good about this and am eager to continue the exercises we began together….only good can come from this! Look forward to hearing more…and sharing more good news! It was a great day and a great cause. I loved being there and singing with you and sharing in the joy of what you are creating. I can’t wait to see this grow along with those t-shirts! Julia, your peace project is truly inspiring and although I can’t be there in person I’ll be thinking about you and the message you’ll be sharing. It’s a message of hope that continues to help me in my life. All the best today! Julia, Thank you for this fantastic and inspring call to Action!!! I have wanted to do something like this for years and just have not got to it yet so I am really looking forward to be part of this project and meeting you at Ground Zero tomorrow. Having been on the baby journey for what seems like an eternity it is so great to expand my focus to creating peace and compassion in the lives we touch everyday. I am inspired by the message that small group of engaged individuals can chart the course of history. In the book “Three Cups of Tea” author Greg Mortenson shows us what a difference one individual can make by raising money and building schools for girls in the most remote areas of Pakistan. His mission is “peace through education”!. I am looking forward to this and think it is going to be a big snowflake in my healing. I feel you are sincere in your motivation. My prayers are with you for a wonderful and productive 9/11 event. Wow yes I’m inspired too! Both by your new initiative Julia and these posts in response. So wonderful to hear about all the miracle babies and about the work Suzanne and Anna have done and how life is different for them since starting to turn things round in this allegedly baren land that’s called ‘infertility’, what richness they have found that was waiting to burst through given the chance. Thank you too for the AWE in autism Jill. Right now I guess I am mid turn in turning things around in my life. This turn is almost imperceptible like the guy in Time Square in Tom Robbin’s ‘skinny legs and all’ novel taking a full hour to make a single rotation. You don’t notice the movement unless you go away and come back. Those I see less often who care for me a lot, especially on reflection. So our little movement may seem almost too small to perceive right now but I say rest assured it will be a movement and it will turn around and it will be noticed: at first by those who share our love and concern for our children – born and unborn – most and then the more distant bystanders and then who knows – let’s see! So give me a date and I’ll see you in London Suzanne, would love to meet you! I’ll light a candle too on Saturday. Go Julia go! And go all of us! Hello Julia. You opened my heart a couple of years ago and I am forever grateful. It was so necessary! I remember joining your phone circles; I couldn’t breathe properly, my own heartbeat irritated me and my speech was much too fast… These were just a couple of outward manifestations of a pretty tormented life. I was driven by reactions and lots of unbounded emotions (with focus on anger). I was unaware of my Orphan reality, didn’t know how to access the Visionary, and felt unworthy of the love of the Ultimate Mom. thank you! I hope in due time I figure out how to support this effort. I am inspired. On September 11 I will be in Belgium with my family. But I promise to light a candle and think of you and the people around you. Julia I have just posted on the new site. It really did fill me with such tremendous pleasure to see the site up and running. I couldn’t agree more with Burtie about you being such an INSPIRATION. (And Burtie I look forward to meeting you in London!). This is a timely post for me as we approach our five year ‘anniversary’ of trying to conceive a child in a few weeks time. I hear what you say about pain being a way of grabbing our attention – I can relate to that on many levels – even physical pain. I am kinder to my body now than I was before and on the times when I do get cramps and pain during my period I use it as an opportunity to slow down and nurture myself and snuggle up with a hot water bottle :) Much of the pain and suffering in the world could surely be related to people’s inability to be kind to themselves (and of course to others). Kindness can mean hearing the orphans! Especially the raging, angry or jealous ones that we might find difficult to hear. And as I re-read your blog again, what I see is that when we can listen to and heal our orphans, we can transform them into Visionaries and so so much more is then possible. Right now I can hear an orphan who is scared, saying ‘ no one will want to come to your circle, it will be a failure’ – this orphan wants me to stay safe and not “risk” failure. Failure hurts. And I suppose we all have similar orphans that want us to stay with the status quo and not rock the boat. But we wouldn’t evolve much if we let those orphans run the show and we wouldn’t be doing anything to make the world a better place. So Julia my OVUM all hear you and I am looking forward to being part of this new community and helping birth peace and fertile hearted humans. I get an image of you walking along your road to peace with troops of people behind of you – of all ages. It is a delicious image!! Just a quick post (my beautiful baby is just waking up for a feeding) to provide my support. Thanks to Julia’s work, I birthed a healthy baby girl less than six weeks ago. I am looking forward to hosting a circle on September 11 here in the San Francisco area. The new site looks great and am so inspired by the cause. Great work Julia. I wish I could be there with you on Sept 11, but I am already committed to a volunteer event with Susan G. Komen that day. I will be thinking of the power of positive thoughts and actions, and the support and energy Fertile Heart has brought into my life. Hope it is a wonderful, energizing day! Julia, you have done it again.count me in! Speaking of staying fertile, I’m so inspired by your commitment to keep birthing new creations! I’ll be there on 9/11 with my miracle baby…not aa baby anymore. i’m so excited about you finally meeting her. I really don’t think she would be here without Fertile Heart. Yes, yes, yes to what you’re saying about earning our optimism to become parents. And you’re aalso so right about how easy it is to forget about everything we went through and remember that other people are going through it right now. It’s the same with the fertility stuff and with the horrible violence going on in many places in the world. It’s also easy to feel like we can’t do anything about it. So what you are inviting us to do is really, really important. And speaking of the Ultimate Mom validating your effots (as you would say…) I don’t know if you saw the article in the New York Times today, I just have the online version. It’s all about the terrible violence in Venezuela and the discussion that started with an image in the newspaper. It made think of the newspaper images in your video and the beautiful lines in the Birthing a Human Type that Will Do No Harm poem on your new website, which made me cry by the way,it’s so moving! Can’t wait to see you and blessings on OUR beautiful new project!! !